Trinity Church, Boston, was completed in 1877. Its architect was H. H. Richardson, and numerous artists and craftspeople contributed to the interior design. In 1971, Trinity was designated a National Historic Landmark for "possessing "exceptional value in commemorating or illustrating the history of the United States." 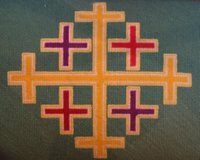 Kneeling stool needlework cover from Trinity Church, Boston. This cover represents the Jerusalem Cross. It served as the cross for the Crusaders, with the four arms representing the spread of Christianity to the four corners of the earth. The smaller crosses are symbolic of the four gospels, the cornerstone of the story of Jesus' life. Trinity Church, Boston - Jerusalem Cross, from Art in the Christian Tradition, a project of the Vanderbilt Divinity Library, Nashville, TN. http://diglib.library.vanderbilt.edu/act-imagelink.pl?RC=51529 [retrieved April 23, 2019]. Original source: Collection of Anne Richardson Womack.